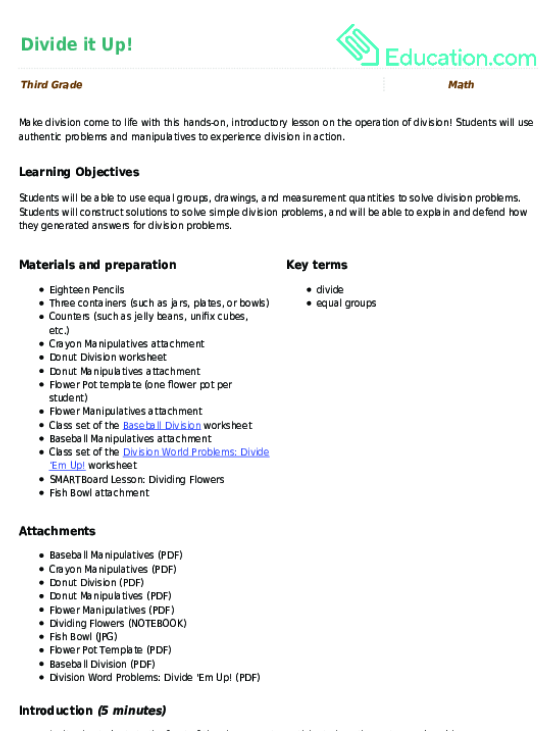 Students will be able to solve basic multiplication and division problems. Ask the students to explain what multiplication is. Potential guiding questions include: What process is being repeated when you multiply? 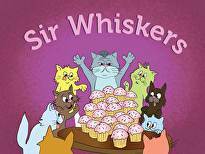 When multiplying a whole number, does the number you start with get bigger or smaller? Make sure that your students know that multiplication is like adding groups of numbers together. 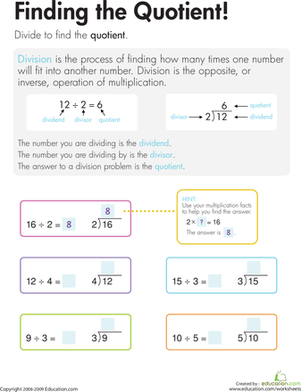 Ask the students to explain what division is. Potential questions include: What process is being repeated when you divide? When you divide a whole number, does the number you start with get bigger or smaller? Make sure that your students know that division is breaking apart a big number into smaller numbers. Ask the students if they have ever heard of a fact family before. Give the students sufficient time to express their ideas. 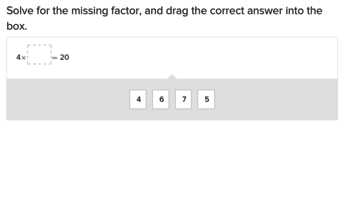 Make sure the students mention that fact families are three numbers that are related, just like the students and their family members are related. Explain to the students that just as there are fact families in addition and subtraction, we can also use fact families with multiplication and division. Explain to the students that memorizing fact families will help them have more fluency when they solve multiplication and division facts. On the board, write down a multiplication and division fact family. For example: 3, 9 and 27. Next, write out the equations using the three numbers chosen: 9 x 3 = 27, 3 x 9 = 27, 27 ÷ 3 = 9, 27 ÷ 9 = 3. Ask the students what they notice about the numbers. Potential guiding questions include: Are there any patterns? How many numbers are used to create the four equations? Come up with another set of three numbers. Complete the fact family on the board. 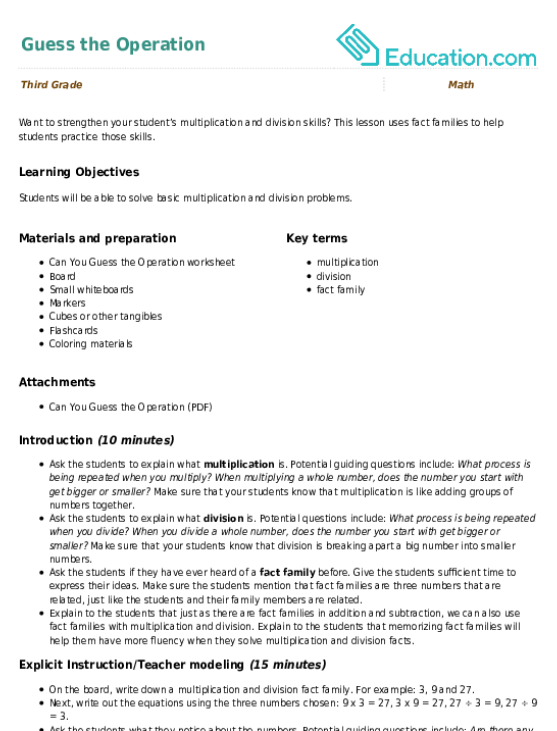 Next, write down a set of fact family equations without the operation symbols. Ask the students what is missing from the equations. Ask the students to explain in detail, prompting with questions such as: What are the four operations we’ve learned about in math? Why is it important to pay close attention to the operation in an equation? Explain to the students that with multiplication, they start with a small number and end with a large number. 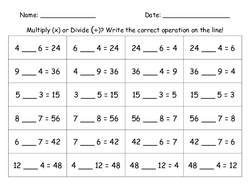 Tell the students that they should choose multiplication to fill in the blank and see if it makes sense. Fill in the multiplication sign. Continue this modeling process with the next three equations. Ask the students to come up with a few more fact families. Examples include: 5, 3, 15 or 5, 6, 30. Write the three numbers and the fact family equations on the board without the operations. Call students up to the board to solve the equations with the missing operations. Ask them to explain their strategies as they solve the problems. Continue this process until you observe that students understand the concept. Pass out the Can You Guess the Operation worksheet. Read the directions to the students, and ask them if they need any clarification. Give the students time to solve the problems individually or with partners of their choice. Support: Students who need extra practice can use flashcards and cubes to solve multiplication and/or division facts. Enrichment: Students can come up with their own fact family equations on the backs of their worksheets. 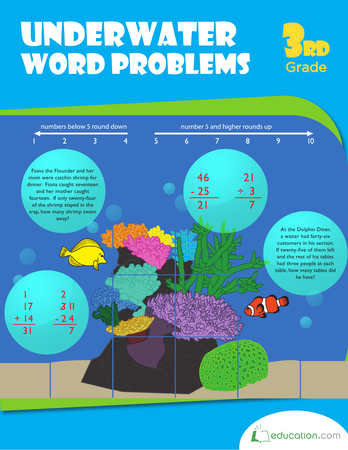 Students can also make up story problems using their fact families and draw or color a picture to show the solution. Observe the students during guided practice and independent practice. Students should turn in the worksheet when they are finished. Ask a volunteer to come up to the board to write a fact family. 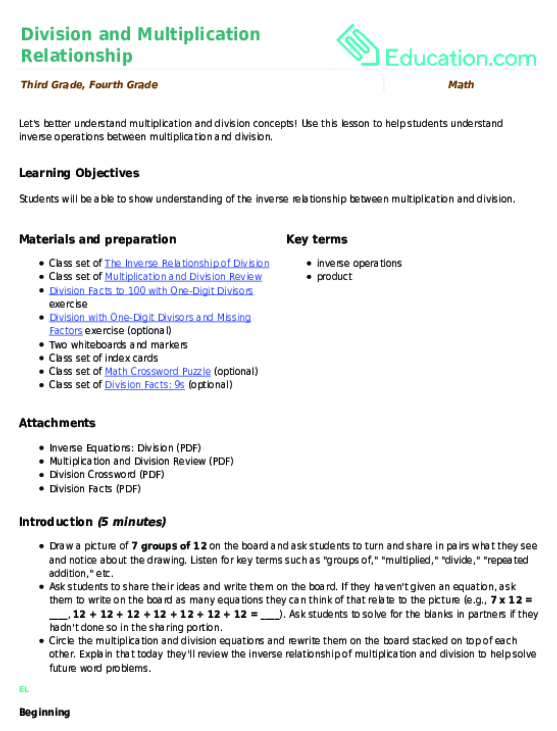 Ask the students to discuss whether division or multiplication is harder. Have your students partner up to discuss this. Ask a few students to share the answers they discussed with their partners and as a class, discuss the strategies you’ve learned that could make solving the equations easier. After doing some division problems to compare the values of different products, students put their skills to the test with fun worksheets. Our old pal Jumbo the Elephant is back, and he's looking quite fashionable. However, he needs to find the right accessory before he goes out on the town! Poor Mommy Birdy can't find the right egg! Help her by solving these simple multiplication problems.